Dogs that hold onto toys and won’t let go on command. Dogs that growl when you approach them while their playing with a toy or chewing on a bone. Dogs that hover over their food dish or start eating before you even fill the dish. Dogs that run off anytime they are given a treat or toy. These are all signs of possessive issues. In most cases, just because your dog covets items doesn’t mean they are aggressive but rather using their base protect instincts. One way to avoid possessiveness is to remove the items causing the behavior. Your dog’s toys or bones should be eliminated or at the very least put away until corrective behavior measures are taken. 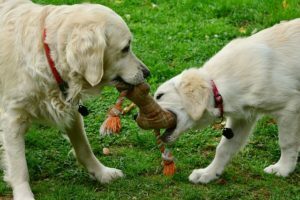 Although this may be difficult if you have more than one dog, feeling like you’re being unfair to the non-possessive dog, your pooch won’t miss what he doesn’t have. It’s best to focus on changing the behavior so they can share and play together in harmony. Give or leave command are important. If your dog was already taught these commands, he may need a refresher. If this is something he hasn’t been taught, now is the perfect time. One method for teaching give is to give your dog a toy, then lightly tug and say the word “give”. Once your dog opens his mouth to give you the toy, make sure to praise him and give him a treat. After your dog has this mastered, it will be easier to correct any possessive behavior. Make it clear to your dog that you are the one who provides food, treats, bones or toys. At feeding time, command your dog to sit until he’s told by you it’s okay to eat. When giving treats or toys to your dog, have your dog earn them. You can do this by having your dog sit, lay or shake to receive their reward. It’s a good idea to teach your dog patience, so take a minute before giving them their reward. These little steps will help your dog understand that you’re in charge. Helping your dog through this behavior will help both them and your family. Your dog will be unburdened by know they can always count on you to provide for them. Another way you can provide for your pup is by getting him a My Pet Pail. Whether you’re planning to travel a long distance or just a day at the park, with My Pet Pail all your dog’s supplies will always be right with you. This revolutionary product contains spill-proof dog bowls, containers for storing extra food and water, a handy utensil, and doggy bags. Plus, you’ll never be caught without a leash or collar since they act as the straps on the My Pet Pail. My Pet Pail isn’t just for travel, the top easily detaches for daily in-home use. Order your own Pet Pail today! !